The side of the tire is called a sidewall and the information contained here tells you everything you will need to know in making the right decision when replacing the tires on your passenger car or light truck. Letters C, D, E, and F designates the load rating of the given tire. Measured in millimeters, this three-digit number is the width of the tire from edge to edge of the sidewall. The greater the number is, the wider the tire is. The aspect ratio, also referred to as series or profile, is the ratio of the section height to the section width. Aspect Ratios usually range from 30 to 80. The lower the number, the shorter the sidewall is relative to the section width. The letter R in the size description designates the tire as a radial. It also must have the word “radial” on the sidewall. The diameter of the wheel or rim in inches. The service description includes the load index number and speed symbol letter. The ply and fabric information indicates the number of plies and the cord material in the tire tread and sidewall. Tires marked with the M+S symbol mean that the tire meets the standards for limited mud and snow use. The Mountain and Snowflake symbol indicates the tire meets the requirements for traction in severe snow conditions. Some tires will have an arrow designating the rotation of the tire when the vehicle is moving forward. 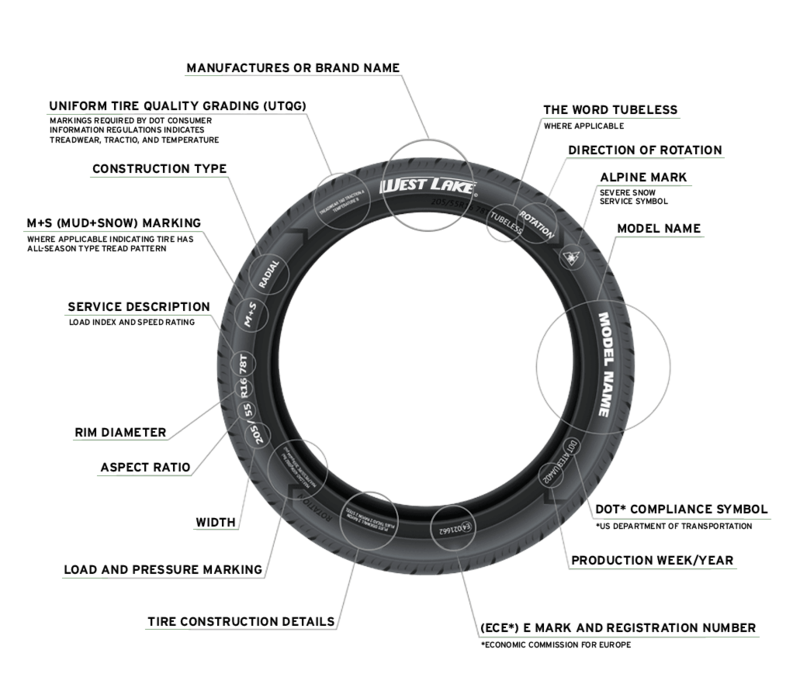 Always mount these tires in the correct direction of rotation as the tread pattern is designed to perform when driven in the specified direction. The US Department of Transportation has established safety performance standards tire manufacturers must follow. The “DOT” symbol certifies the tire manufacturer is following these standards. Next to the DOT is the Tire Identification Number (TIN). The TIN contains the tire plant code, and the last 4 digits are the week and year the tire was manufactured. These markings indicate the maximum load and maximum cold tire air pressure in both metric and standard units.